The Planotec P47 Scintillator Discs are coated with a highly uniform layer of carefully selected and graded P47 phosphor to provide a high signal output and exhibit excellent working life. They are considered best quality scintillator discs and are used by several SEM manufacturers. The Planotec P47 Scintillators are engineered to give the best S/N ratio and imaging quality with a delay time of 80 nano seconds. For best signal intensity they are not coated. They are available for virtually all SEM models, see the list with the ordering information. Since the constant bombardment with accelerated electrons and the constant ionization of the layer will slowly deteriorate the P47 layer is recommended to replace the scintillator disc at regular intervals to maintain high image quality. Contamination of the P47, caused by hydrocarbon deposited on the scintillator surface, will also decrease the signal. Since signal decrease mostly occurs at a slow rate it is not readily noticeable from one day to the other, but when a new scintillator is installed, most operators will notice a dramatic improvement of image quality. Our recommendation is to renew scintillator discs every 6 months on regularly used systems and yearly at systems with low use. They are not recommended where light leakage, vacuum sealing or backstreaming might be a problem. 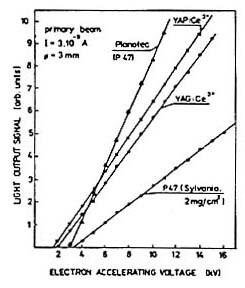 YAP crystals are a single crystal, glass-like material and are more efficient in light output than YAG (see graph). The emission spectrum peaks at about 378nm (same blue as p47), corresponding reasonably closely to the maximum sensitivity of the S11 photo multiplier (commonly used in SEM's). In such microscopes there would be a significant improvement in signal by using a YAP crystal rather than YAG. Decay time of YAP is 40ns compared to YAG of 60ns, so that overall performance is superior to YAG, for SEM applications. Improved signal to noise ratio (S/N) especially at high magnifications.Very long lifetime. Can be cleaned (polished) and recoated. Best to coat with 50nm Al to avoid light sensitivity. Does not degrade when bombarded by electrons or ions, thus making YAG suitable for high current operations. Very long lifetime. Light emission peaks at about 560nm (yellow) which means that an S20 photomultiplier is most suitable for detecting the emission. Response is better for YAG than for Planotec P47 discs below 5kV and again at higher accelerating voltages over 100kV, where the performance of powder scintillators falls off while YAG response increases linearly. Although the signal from YAG and YAP is less than the P47, the S/N ratio is better and therefore the final signal is better. Decay time approx. 60 nanoseconds. The side towards the light guide is micro-textured to increase light emission. Can be cleaned (polished) and recoated. Best to coat with 50nm Al to avoid light sensitivity. The YAP or YAG crystal should be coated with 50nm of aluminum before use to prevent light sensitivity. The matt textured surface is mounted in contact with the light pipe for improved light emission. See Scintillator Selection Guide for size and ordering information below for pricing.